Given the array of serious national and homeland security problems we currently face, we thought it might be time to revisit our 1999 scenario “Axis 2001” or our 2010 commentary “Red Team Journal, Thirteen Years On.” After re-reading both, however, we realized we have little new to add to either post; they’re as timely today as they were then. Instead, we offer a summary in three diagrams and six takeaways. Diagram one captures our inclination to throw money and technology at the problem. Diagram two illustrates a better way, where money and technology are subordinate to strategy. We spent, and spent, and spent, but the world is no safer, and our relative ability to spend our way out of problems is dwindling. 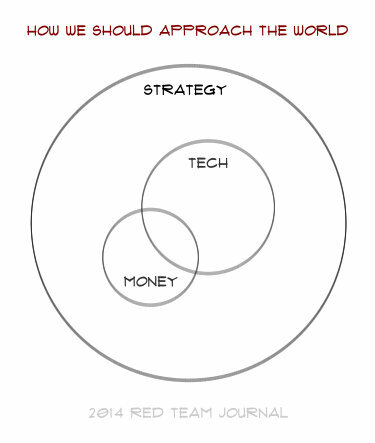 A Venn diagram in which small “tech” and a very large overlapping “money” nearly fill the “strategy circle. Money isn't the answer, but it's now part of the problem. Point strategies yield a false sense of security but often cost more and yield less than pattern strategies. Adversaries with fewer resources but more perceptive pattern strategies continue to give us a run for our money. Point red teaming leads to point strategies. Pattern red teaming encourages pattern strategies. To beat these sorts of adversaries, we need better pattern strategies.